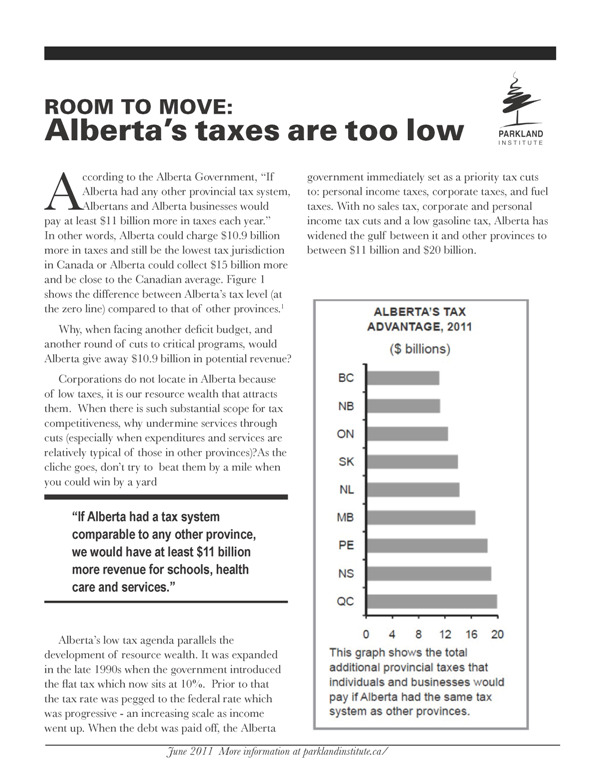 According to the Alberta Government, “If Alberta had any other provincial tax system, Albertans and Alberta businesses would pay at least $11 billion more in taxes each year.” In other words, Alberta could charge $10.9 billion more in taxes and still be the lowest tax jurisdiction in Canada or Alberta could collect $15 billion more and be close to the Canadian average. Why, when facing another deficit budget, and another round of cuts to critical programs, would Alberta give away $10.9 billion in potential revenue? Corporations do not locate in Alberta because of low taxes, it is our resource wealth that attracts them. When there is such substantial scope for tax competitiveness, why undermine services through cuts (especially when expenditures and services are relatively typical of those in other provinces)? As the cliche goes, don’t try to beat them by a mile when you could win by a yard. Alberta’s low tax agenda parallels the development of resource wealth. It was expanded in the late 1990s when the government introduced the flat tax which now sits at 10%. Prior to that the tax rate was pegged to the federal rate which was progressive - an increasing scale as income went up. When the debt was paid off, the Alberta government immediately set as a priority tax cuts to: personal income taxes, corporate taxes, and fuel taxes. With no sales tax, corporate and personal income tax cuts and a low gasoline tax, Alberta has widened the gulf between it and other provinces to between $11 billion and $20 billion. Alberta's education system has been cut, and Alberta is losing 1,000 teaching positions. Schools are being closed, class sizes are going up and special programs have been eliminated. Student grant programs were cut back and cuts to post secondary institutions have meant that tuitions and other fees are rising, student debt loads are on the rise and staff are being cut. Cuts to post secondary meant cuts to the number of seats in medical school in 2010 at a time of doctor shortages. Health care cuts have meant longer waits because cuts have meant not enough long-term care beds, health care professionals, and access to home care/continuing care. Privatization and cuts have meant that Albertans have the highest out of pocket expenses in the nation for health care. Environmental monitoring and regulation have been cut, reducing protection for land water and air. Quality, affordable childcare is inaccessible to many even if they put their names on the wait list when they conceive. Child care is expensive and wait lists are long. A June 2010 survey of Albertans found that 82% either somewhat or strongly agree that Alberta has a pressing social deficit. In that same poll, 65% of Albertans supported the statement that the government should decide spending levels for programs and services based on the public’s need for the programs and services instead of ability to afford them. Polling has shown that Albertans are willing to pay more for public programs and services such as health care and education. A CBC poll conducted after the health care premium was eliminated found that the majority were in support of increased taxation for health care even if it meant bringing back a regressive tax like the health care premium. Similar results were found in public opinion polling after the GST cut. Why, then, is the province giving away revenues that could be used for funding social services and cutting critical public programs?